If your important WhatsApp conversations have just been deleted but there is no backup for it, you can quickly recover deleted WhatsApp messages and media like photos, videos from Android by using Gihosoft Free Android Data Recovery tool. With this freeware, you can restore WhatsApp chat history from a variety of Android brand phones, like Samsung, HTC, LG, Google Pixel, Huawei, Motorola, OnePlus, Sony, ZTE, etc. 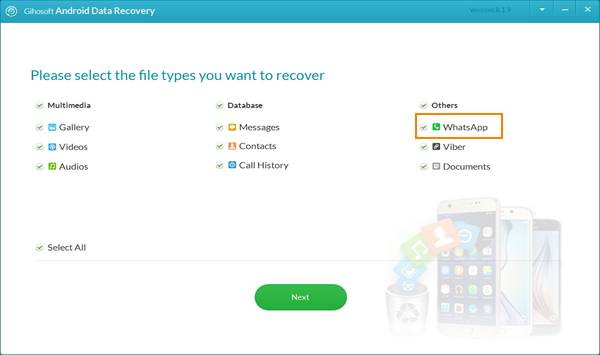 After you start the WhatsApp data Recovery for Android tool, you can select the file types to recover. Just hit the “WhatsApp”option and then click on “Next”. Connect your Android phone to PC by USB cable. Once the two are connected successfully, your device type will be presented. Click “Start” to begin the scanning process. You might have to wait for a few minutes. The wait time depends on how many files the software has to scan. Here is how it works – the lesser the number of files on your Android device, the quicker the scanning process. When scanning is finished, all the WhatsApp related files will be listed on left panel. Please preview and select those you want to recover. 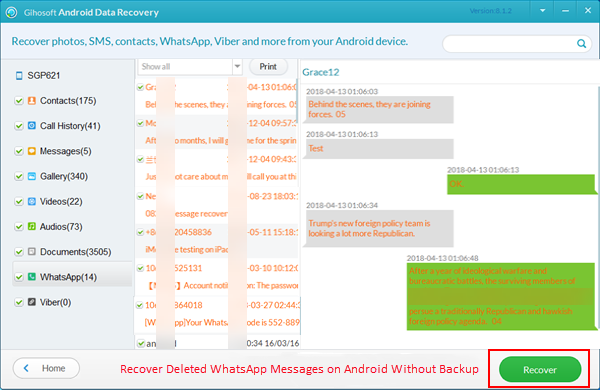 Then, click “Recover” to retrieve deleted messages on WhatsApp from Android device. We know that data can go missing from your smartphone due to different reasons. It could be a software crash. Your device could have rooting issues. Or, you could have deleted it accidentally yourself. 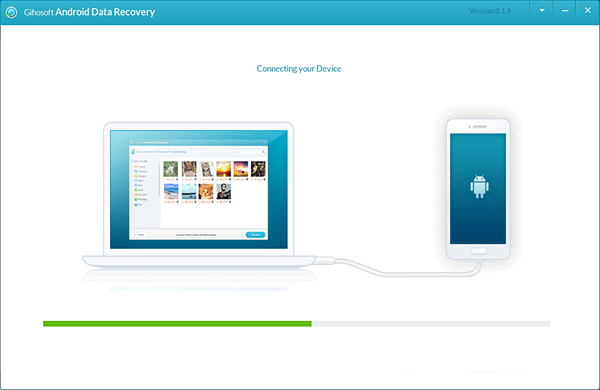 Make data recovery simpler – from both your smartphone and table, with the Free Gihosoft Android Data Recovery software. It doesn’t matter what you need to get back – whether it be contacts, your favorite music or movie that you mistakenly deleted, or even Whatsapp messages. Recover more files in just a few clicks. Yes, you can restore Viber messages on Android, or recover deleted text messages from Android easily. WhatsApp automatically make local backups of chat history at 2 a.m.. Also, you can back up your WhatsApp chats and media to Google Drive. So if you accidentally deleted your WhatsApp chat history, you can easily restore WhatsApp from Google Drive or local backup. If you have backed up your WhatsApp chats to Google Drive, it would be simple to get them back. If you have not backed up your Whatsapp messages, here is what you need to do first. Click on the three dots at the top right an then select Settings. You will find the Chats option. Go for the WhatsApp Chat Backup option. You will now find two options – either to back up instantly or to back up to Google Drive at regular intervals. You can follow below instructions to restore WhatsApp messages or chats from a Google Drive backup. However, do ensure that you already have completed the steps above. Uninstall and reinstall WhatsApp from Android. Ensure that the same Google account used to create the backup has been added to the phone. After verifying that the same phone number is used to perform the backup, tap on “Restore” when prompted. 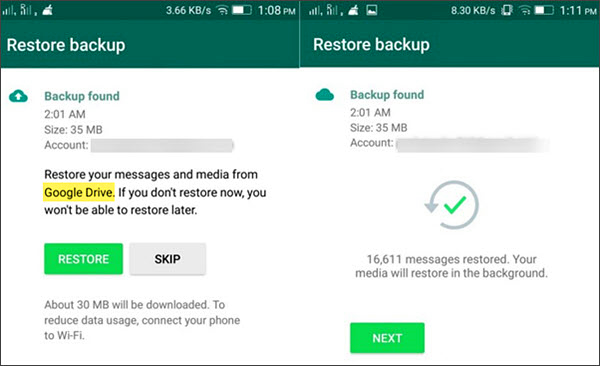 If you deleted WhatsApp messages without any prior backups from Google Drive, don’t worry, WhatsApp will allow you to restore from your locally stored backup files. If you just deleted the file, you can find the file on your device itself, up to seven days from the file deletion. In Android file manager app, go to “Internal Storage/WhatsApp/Databases”. From the backup file extension, you can easily figure out when each backup copy is made. Rename the backup file that you want to restore from “msgstore-YYYY-MM-DD.1.db.crypt12” to “msgstore.db.crypt12”. Uninstall and reinstall WhatsApp. Click “Restore” when asked. Most often, a few simple tips can ensure that you don’t have to worry about your Whatsapp messages getting delete forever. Always ensure you have the right Google account set up on your phone. Ensure you have the Google Drive chat backup enabled. If you’re taking local backups, ensure your device has enough internal storage. Don’t worry if you have deleted your Android Whatsapp messages. Even if you didn’t do any of the above, Gihosoft can help you recover your files quickly. Just power it on. Connect your smartphone to your PC. Before you know it, you will have all your lost data back with you! If you have an iPhone and accidentally deleted important WhatsApp chats, please refer to “How to restore WhatsApp messages on iPhone” for help.